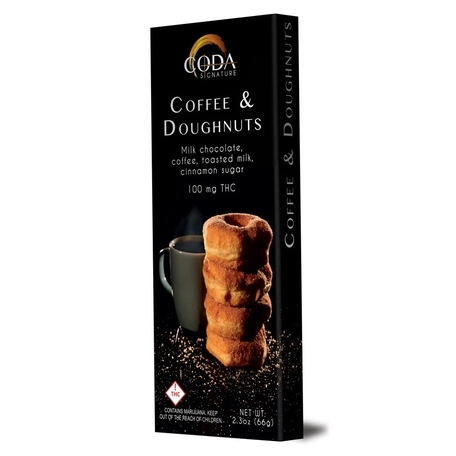 Sign Up for free to save time shopping Coda Signature's wholesale products on LeafLink. 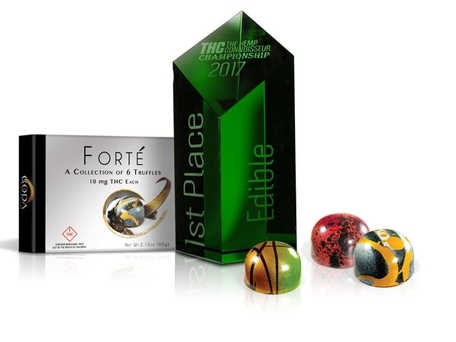 Our mission is to set the standard of excellence for edibles, topicals, & oils in the medical and adult cannabis industry. 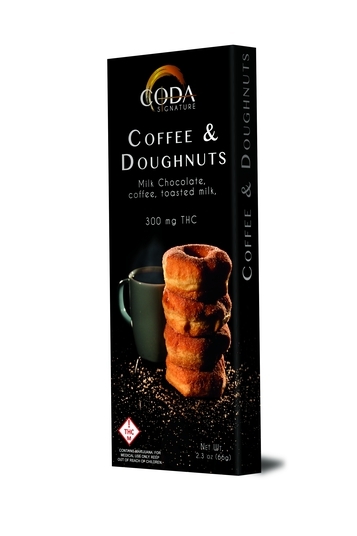 With music as our muse & cannabis as our medium, Coda Signature creates cannabis infused products full of inspiration and imagination. Each product tells a story through exciting colors, bold flavors, & luxurious aromas that harmonize seamlessly with impeccable craftsmanship and quality ingredients. 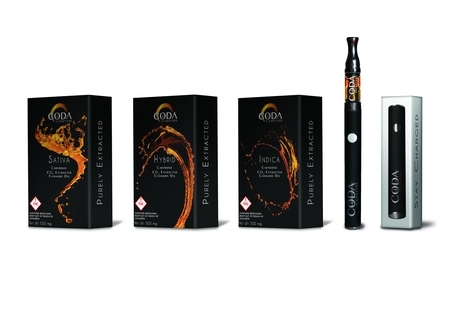 Coda Signature elevates the experience of cannabis the way music elevates life. Colorado's Favorite Topical, now on MED! 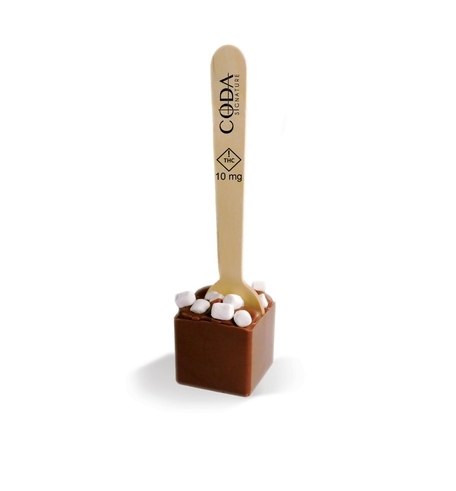 Coda Signature goes beyond dark, milk and white to reveal the fourth chocolate, Blonde. 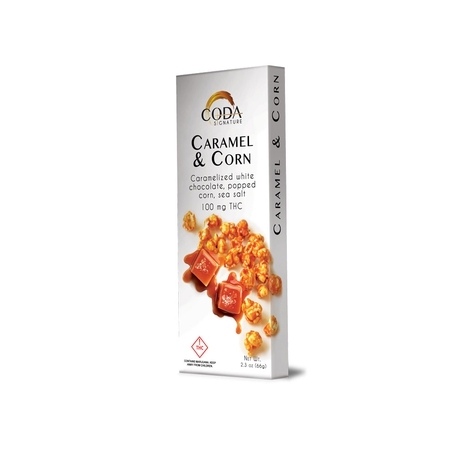 Deeply caramelized white chocolate embraces sweet and popped corn, and finishes with a dash of sea salt. Caramel & Corn is a perfect fusion of sweet and salty. With floral and tart blood orange, bitter burnt sugar crystals, and the warm slow heat of cayenne, each piece is truly a duel of fire and orange. For the extreme dark chocolate enthusiast, our custom blended 80% dark chocolate bar is studded with elegant pink Himalayan salt crystals and topped with honey caramelized cacao nibs. 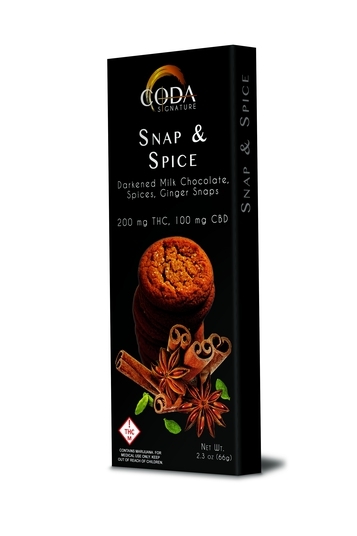 Snap & Spice is a powerful indulgence of intense flavor and healthful benefits. Ginger, cinnamon, cardamom, allspice, anise and a touch of citrus add the perfect snap to our 1:1 ratio of THC:CBD infused darkened milk chocolate. 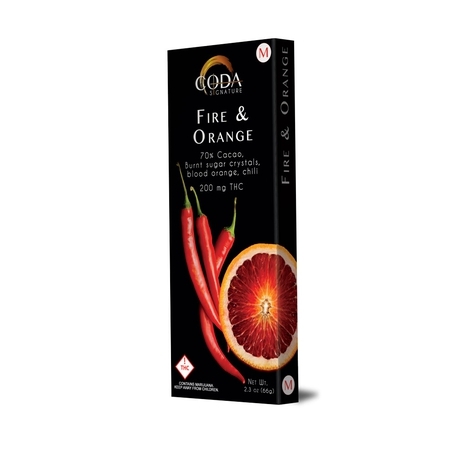 Coda Signature celebrates the natural essence and delicate flavors of cannabis with our proprietary, strain-specific CO2 extracted cannabis oil. Free of harmful solvents, cutting agents, or additives, our Purely Extracted terpene rich cannabis oil gives you a clean and delicious experience every time. Our Purely Extracted 500 mg cartridge is available now in various strain specific Sativa, Hybrid, and Indica strains. 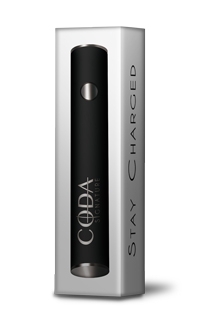 The Coda Signature Stay Charged variable voltage battery is small but powerful. Featuring a strong charge, variable voltage options, and a luxurious soft touch finish, it is the perfect pairing to our Purely Extracted cartridges. $7.50 each. $90 per case. 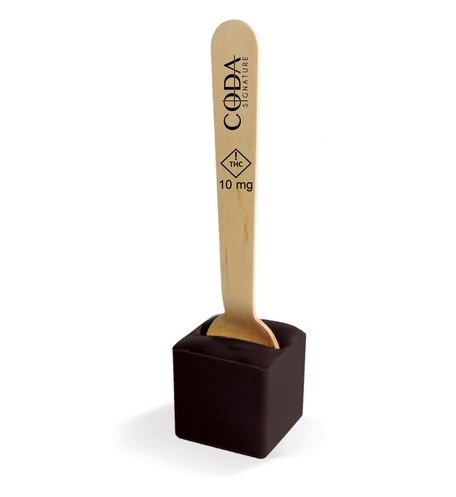 Coda Signature’s cannabis Chocolate on a Spoon is the perfect accompaniment to the warm crackle of a fire or melted over cold, rich ice cream. Whether you are curling up under a cozy blanket or cooling off after a hot summer day, simply melt the Chocolate on a Spoon into a warm liquid of your choosing, or melt with gentle heat to drizzle over ice cream. Any way you choose to indulge, Chocolate on a Spoon will satisfy your chocolate craving. This milk with marshmallows adds a bit of whimsy to the classic hot chocolate. $3 each, $36.00 per case. Work hard, play hard? Active Extra Strength Muscle Salve won’t let you down. Our proprietary combination of emollient rich oils hydrate skin while delivering a rush of cooling sensation. 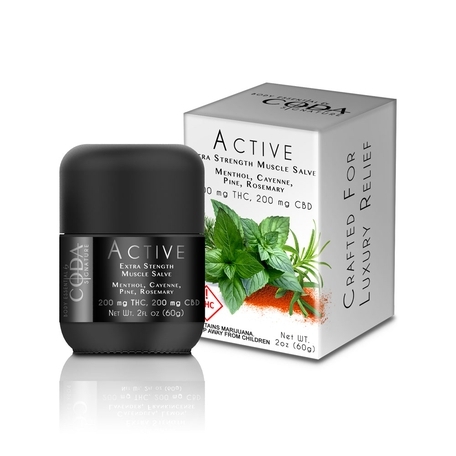 Active Extra Strength Muscle Salve combines Cayenne and Menthol to invigorate the skin and body. Lobelia and Devil’s Claw are incorporated to ease and relieve tired muscles. The fresh aroma of Pine and Rosemary essential oils revive and stimulate. 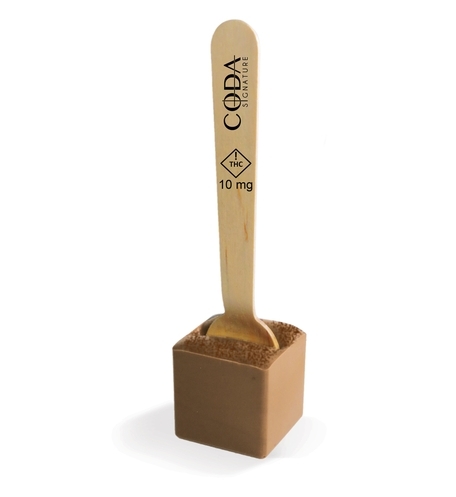 Body Essential by Coda Signature blends the synergistic effects of cannabis with the ancient healing properties of herbs and the delicate fragrance of essential oils. Our Extra Strength Salves start with a deeply moisturizing proprietary blend of olive oil, apricot oil and grapeseed oil. This blend of carrier oils absorbs easily into the skin and contain antioxidants, as well as vitamins A & B to help rejuvenate skin cells. Our oil blend is fortified with a combination of emollient rich shea butter and beeswax. Body Essential Salves feature responsibly sourced herbs, infused into our proprietary blend of carrier oils, then gently pressed in house to extract the greatest spectrum of active components. Intended Use: Massage this salve onto an area of the body that needs revitalization and savor the stimulating aroma of menthol and pine. Warning: This product is intended for skin and body application. Avoid contact with eyes and sensitive skin. Do not apply to injured, irritated or broken skin. Do not use with a heating pad. Do not bandage or cover with a wrap. This product may cause a reaction for some individuals; test on a small area of skin before use. Consult a physician before use. 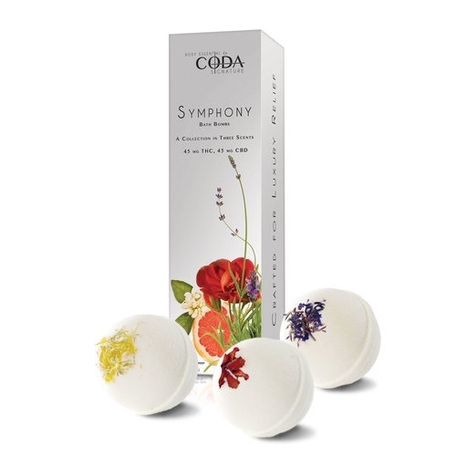 The Body Essential Symphony Bath Bomb Collection orchestrates the rich effect of cannabis with our unique oil blends to provide a total body experience. 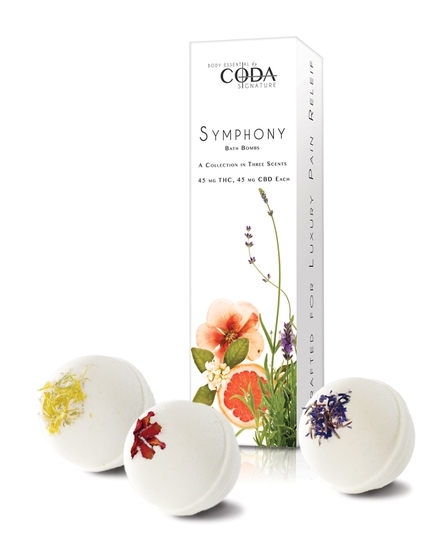 Simply drop a single bath bomb into a warm bath, submerge yourself, breathe deeply, and let the effervescent experience wash over you. Have dry, tired skin? 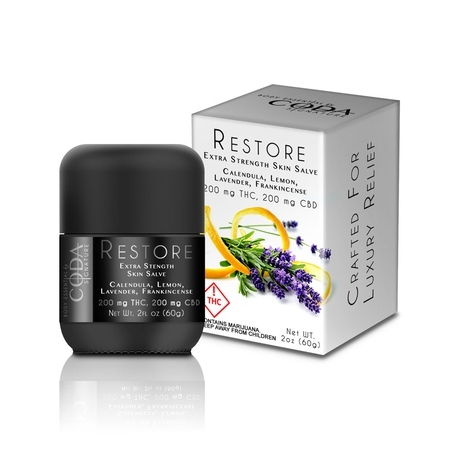 Restore Extra Strength Skin Salve works extra hard to deliver a rejuvenating, luxurious experience that soothes and softens the skin. Restore Extra Strength Skin Salve incorporates the calming properties of Calendula and Gotu Kola, as well as the rejuvenating properties of Yarrow. Lemon, Grapefruit and Frankincense essential oils lend a bright and clarifying effect to the salve. Intended Use: Formulated with rich emollients and an ensemble of essential oils, massage this salve onto any area of the body that needs softening. Warning: This product is intended for skin and body application. Avoid contact with eyes and sensitive skin. Test on a small area of skin before use. Consult a physician before use. 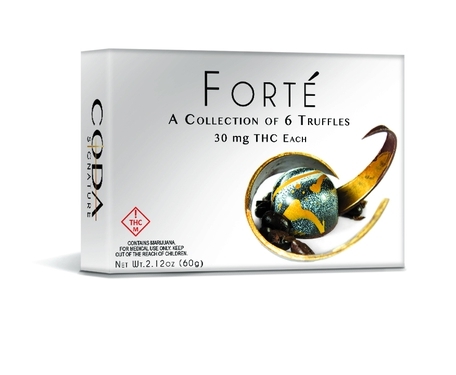 Winner of the 2016 Colorado Cannabis Cup, this collection is full of great anticipation. 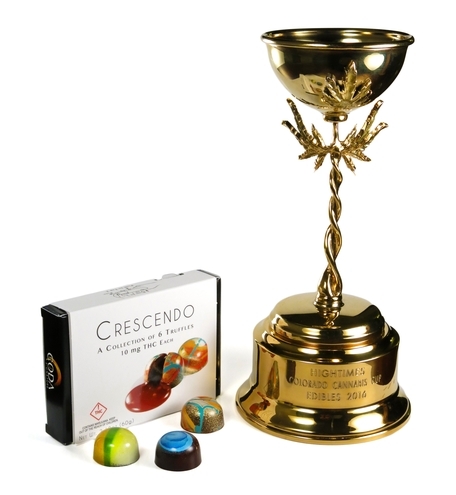 It begins with white chocolate filled with fresh lemon and a hint of juniper berries inside a milk chocolate shell. 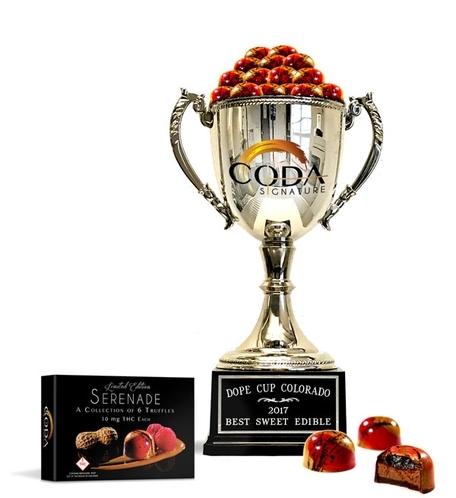 The excitement grows with milk chocolate steeped with Earl Grey tea leaves and sweetened with Colorado Honey. 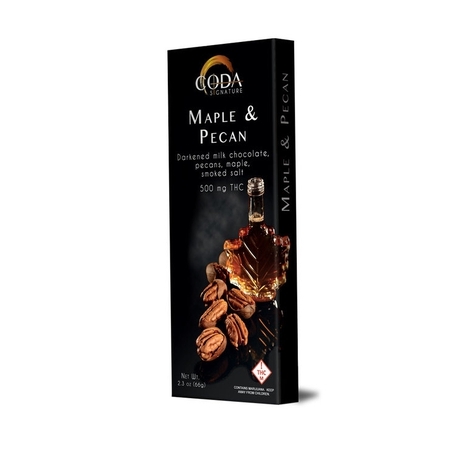 And at the peak of this grand crescendo is a luscious caramel spiked with Maldon salt crystals. 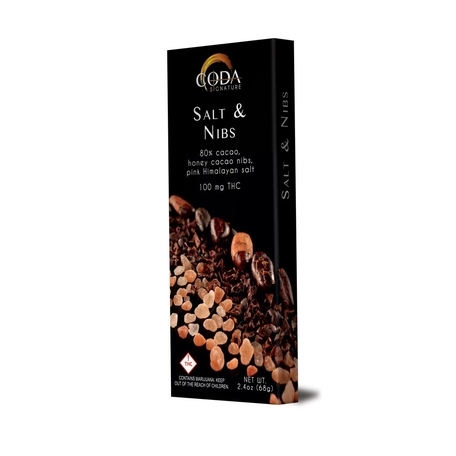 In this collection, Coda Signature serenades the great love affair between peanut butter and jam. Roasted peanut butter marries creamy milk chocolate and is passionately kissed with tart raspberry jam. 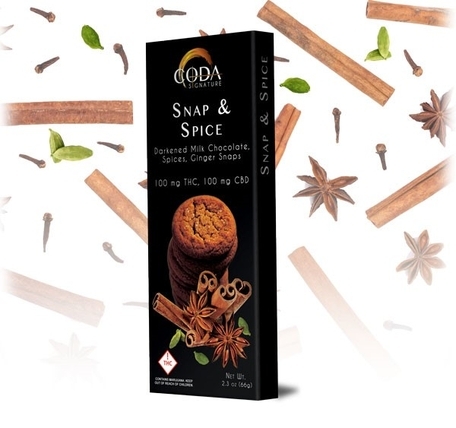 Snap & Spice is a powerful indulgence of intense flavor and healthful benefits. 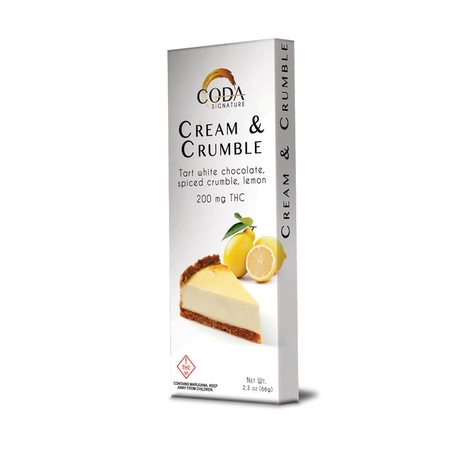 Ginger, cinnamon, cardamom, allspice, anise and a touch of citrus add the perfect snap to our 2:1 ratio of THC:CBD infused darkened milk chocolate.